Flybe promotion code - 15% discount on all flights! Flybe promotion code – 15% discount on all flights! UK based low-cost carrier Flybe, offering its service to 127 routes in 9 countries, has just released brand promotion code in 2018. This airline was founded in 1979 and is based in Exeter. Nowadays operating more UK domestic flights than any other airline. Consider to use their service from the UK cities such as Birmingham, Manchetster, Exeter, Cardiff, London or Southampton. You can fly to European cities such as Amsterdam, Paris, Bordeaux, Dublin, Berlin, Milan, Verona and more..In ocassion of 15th of Anniversary this company is giving away 15% discount code on all flights to all destinations! To apply Flybe discount code simply use below voucher at the main page of the carrier where you will find separate box “I have promo code”. Proceed to next step and your flight will be automatically discounted. Note that this offer is only valid for next few days..Travel period is then between 8th of September and 2nd of October 2018. Discount applies only against base fare and does not discount optional service i.e. additional checked luggage, seat assignment or travel insurance..Flybe voucher code is applicable only when booking directly at website of carrier where you can also find all conditions of this current promotion. This promotion with Flybe is valid for bookings made by midnight on 27th of August 2018. Below you can find our booking sample of successfully applied Flybe promotion code. In this case you would depart from London City to Amsterdam on 26th of September. Your return flight would be then on 29th of September 2018. 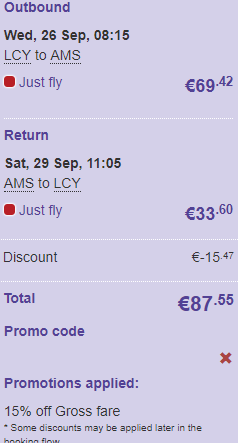 You would easily save €15 just by using this latest Flybe promo code 2018. To benefit from this discount look for flights departing in September and October. 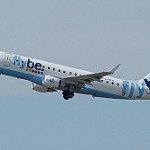 Once we will spot another Flybe promotion be sure it will be updated in this article..